When designing a room, it is important to choose an appropriate focal point that will allow you to build upon its style throughout the rest of the space. A good example of a common focal point that can be made creatively unique is the fireplace. Plenty of homes are equipped with one whether they be wood-burning or gas, part of the interior architecture or portable. There are multiple ways to direct the viewer’s eye in towards it and add comfort and warmth to your design. To start, look at the benefits your fireplace does offer. If it is more on the bland side and in need of a makeover, consider updating its facade. A textured stone look with a large wooden mantle above the hearth would add visual interest and immediately make guests feel cozy. 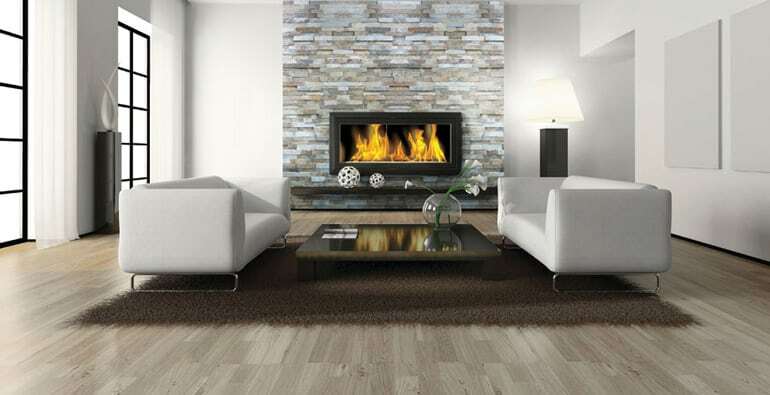 If you have more elaborate furnishings in the room and want the fireplace to have a smoother look, a recessed fireplace with tile with a high gloss glaze will give it a modern feel. If the fireplace is exactly as you want it to appear, your next job is to stage the room in such a way that guests will automatically be drawn to it. This can be done most simply by arranging the furniture to face it, either directly or at differing angles. A sofa can be placed directly opposite with a beautifully upholstered armchair accompanying it on the side. Don’t forget a side table or two and a coffee table for you and your visitors to place drinks and a few magazines and books. Lighting is also important. Using a soft white bulb will keep the room looking warm and provide just the right amount of illumination to complement the flames coming from your focal point. Be sure to use a dimmer to set the mood. If there is any extra space above the fireplace, try a beautiful piece of artwork with similar hues to the fireplace itself. Try not to install anything too flashy in this space as you do not want to take attention away from your focal point.